Out of the number, 700 were mobile bankers of the erstwhile BEIGE Bank, while 1,000 were former employees of the Royal Bank, the Construction Bank, uniBank and the Sovereign Bank who were transferred to the CBG under a purchase and assumption (P&A) agreement approved by the Bank of Ghana (BoG) on August 1. 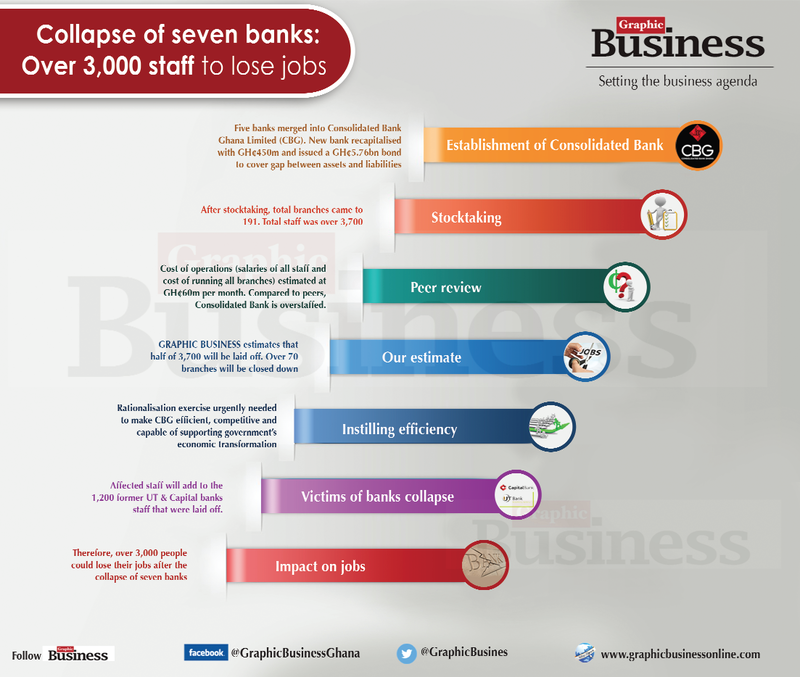 According to sources close to the CBG, the lay off was part of the business rationalisation programme of the new bank to reduce its current operational cost of about GH¢60 million per month and reduce staff numbers by a minimum of 1,700. The bank’s total outlets are also expected to reduce to around 120 from the current 191 branches under a far-reaching exercise meant to make the state-owned lender efficient and agile. The Daily Graphic understands that GH¢60 million is the estimated cost of salaries for all the 3,700 staff and the maintenance of all the 191 branches and outlets of the five banks that the CBG took over on August 1, this year. With over 3,700 members of staff in 191 branches, CBG is overstaffed, compared with the likes of the GCB Bank, which has 1,915 workers in 185 branches; Ecobank Ghana, which has 1,575 workers in 67 branches and the Fidelity Bank, which has 1,027 workers in 75 branches. The rationalisation of the CBG is, therefore, meant to bring its staff numbers and wage bill to the levels pertaining in the banking sector. One source told the Daily Graphic that while the 700 former employees of the BEIGE Bank would be disengaged by the end of August, the other 1,000 workers would be served their termination letters in September this year, after spending virtually two months with their new employer. After the August 1 takeover, staff of the defunct banks were informed that their employment status would be assessed and their fate determined within two months. Just like the affected employees, the branches and outlets belonged to the BEIGE, Royal, Construction, uniBank and Sovereign banks but were transferred to the CBG under the P&A agreement. The source told the Daily Graphic that the rationalisation was aimed at trimming down staff numbers and branch networks of the bank to acceptable levels to help make it efficient and solid to be able to survive in a fiercely competitive banking sector. It was also meant to properly position the CBG as a key driver and anchor of the government’s agenda of economic transformation, one source added. “After everything was put together and salaries for the first month computed, it turned out that wages alone would consume more than GH¢50 million in just one month. “So if care is not taken and the rationalisation is not done properly, the bank may end up using the GH¢450 million that was used to capitalise it on just salaries and that will not make any business sense,” it said. An investment banker and chartered accountant, Mr Mahama Iddrisu, said in a separate interview that the rationalisation was necessary to help save the bank “unnecessary cost” and make it sustainable. “Its cost of operation needs to be slashed to a proper banking wage bill and it should not waste time at all,” he said. Mr Iddrisu was part of the team that integrated the erstwhile The Trust Bank (TTB) into Ecobank Ghana in 2011. “It is better for the bank to use the money it will be using to pay salaries to pay gratuities. It should be able to say immediately that ‘your appointment is terminated and this is your one, two or three months’ salary’; finished,” he said. He, however, noted that for the process to succeed, the entire staff of the bank needed to be properly sensitised to the need for the layoffs and how those to be retained could contribute to the growth of the bank. He added that layoffs must be fair and transparent, such that those who had skills and competences would not be sacrificed for favourites. Mr Iddrisu advised against bringing new people to do jobs that laid-off staff could do, explaining that such an act could breed contempt and form the basis of internal rivalry in the long run. While explaining that competence, experience and age should be prioritised in determining who should be retained or axed, he said special attention should be given to tellers and cashiers who would be retained. “With cashiers, they must have client service experience, speak good English and be beautiful,” he said, emphasising that cashiers must always be presentable “because they are the first marketing persons of the institution”. “For a merged bank, if you do not have tellers who have patience and are presentable, you will not survive,” he said.